The Spring Bear Hunt is very good. This Spring we saw over 80 bears in just 60 days time. Spring Bear have the best hides and you will see mostly big boars. It is pretty much a spot and stalk hunt. We will glass grassy meadows and clearcuts usually resulting in several sightings. The country is steep and brushy; but we can expect to find the bears where the grass is out in the openings; similar to Prince of Wales in Alaska. Our right to use dogs for bear hunting was taken away in 1994, and since then the bear populations in Oregon have exploded. The Fall Bear Hunt is much the same as the Spring Hunt except that we hunt the massive blackberry patches that grow like gang busters in this area. 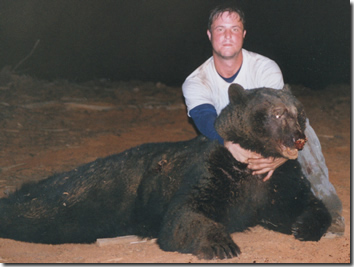 It is very common to get both Spring and Fall bears over 300 lbs. About 50% of the bears we take are color-phased, most being cinnamon/red or chocolate in color. Recreation service provider operating under Special Use Permit with the USDA-Forest Service.